... opening night tickets to every theater around me were sold out literally 2 minutes after the announcement went up, lol. I’m a little bummed, I was looking forward to it. Maybe those people had pre-ordered their tickets somehow? Naw, that wasn’t an option. Had they previously announced that there would be an announcement, and when it would be made? 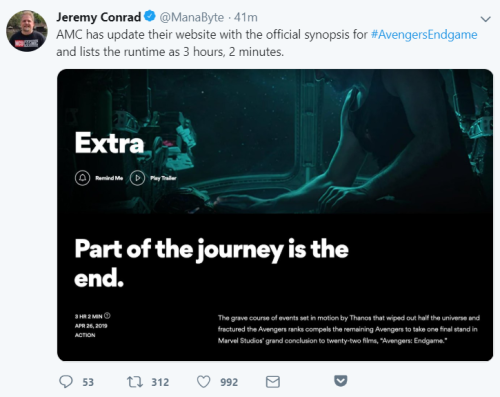 It's hard for me to believe that thousands of people just happened to check a particular website that quickly -- even if the first ones posted it on Twitter. Fandango and other sites crashed because of the mad rush, lol. Ah -- the pre-announcement rumor mill! "Why don’t we talk about how differently they run"
"They’ve actually talked about that (not specifically about T'Challa and Steve), that Chris Evans has to do most if not all his own running scenes because they say his running form is really hard to replicate for a stunt double but it’s one of the things that sets Cap apart, Chris Evans particular type of physicality, and actually helps convey the 'superness' I suppose of the super soldier thing." 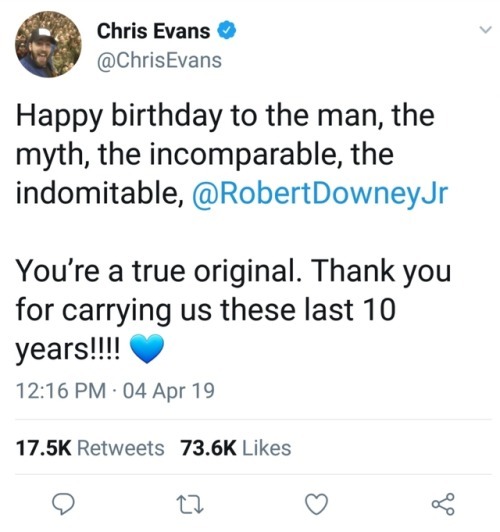 "Chris Evans had to do his own stunts because he runs like a weird idiot robot"
"If I remember my biomechanics correctly, he has basically perfect running form. If you track his head movement there is ZERO up and down motion, meaning his entire energy is going to forward motion, making it 100% efficient. Like, this is 'good' vs 'bad' technique:"
"There is still some waviness to that green line. Chris Evans just has like... none." "so what you’re saying is... Chris Evans really... IS Captain America..."
"No" it looks terrible, "no" it looks scary, or "no" you hate the idea of a Joker movie in general? 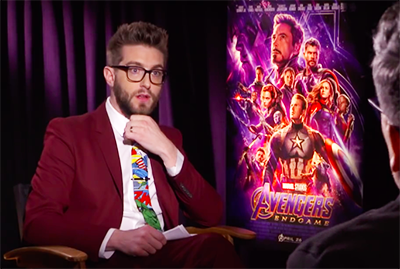 "The interviewer and all of us:"
"Marvel Studios' Avengers: Endgame | 'Stakes' Featurette"
Why do I suddenly have this feeling that 'Endgame' is going to make me cry? Marvel Studios’ “Captain Marvel” will be the first new release in the pay-tv window available on the Disney+ service on Day 1! Theatrical titles will have support for up to 4K HDR video playback, based on a subscriber’s available bandwidth. The highly-anticipated “Avengers: Endgame” will follow later in the year. “WandaVision,” a live-action series with Elizabeth Olsen returning as Wanda Maximoff/Scarlet Witch and Paul Bettany reprising his role as The Vision. “The Falcon and The Winter Soldier,” a live-action series with Anthony Mackie returning as Falcon and Sebastian Stan reprising his role as Winter Soldier. Tom Hiddleston will be reprising his role as the God of Mischief in “Loki” for the streaming service. Lastly, “Marvel’s What If...?,” the first animated series from Marvel Studios and takes inspiration from the comic books of the same name. Each episode will explore a pivotal moment from the Marvel Cinematic Universe and turn it on its head, leading the audience into uncharted territory, such as what if Peggy Carter took the super soldier serum and Steve Rogers joined the fight in an armored suit from Howard Stark? pay-tv window available on the Disney+ service on Day 1! ??? What language is this in? I think it's the new entertainment-speak. I was thinking about this scene from Age of Ultron. What if all the avengers use the stones? They are six (the original six) the stones that they replicate are six, if they use each one a stone then they would share the power and maybe they will survive. I’m thinking about what stone each would use, what do you think? 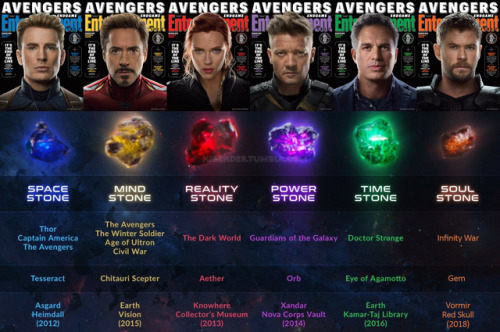 Maybe Thor should use the Space Gem and the Cap the Time Gem, Tony the Soul Gem … I do not know but I think this could work. What you’re saying maybe is actually true. Even, there is a clue for it. The Original 6 Avenger got their own promotional magazine covers. Each of them was paired with a specific color. These colors are the colors of the gems. A clever fan did a picture about the pairs. So, if you study this picture, you can see, every Avenger got their own color and according to the color they also got a gem. Maybe these magazines are subtle hints what will happen. The picture belongs to @hjbender and the original post is found here. Oh you should see some of the mind-bendy theory posts out there, lol. This is nothing. That's a lazy excuse, lol. "Josh Brolin answers Infinity War’s biggest question:"
"So you’re telling me he killed half the universe instead of creating more resources because HE DIDN’T THINK ABOUT IT?! Thanos: So, we’re running out of resources and the population keeps growing, what do we do? Person 1: Kill half the population? Thanos: Excellent idea, I’ll write it on the board. Anyone else? Person 2: Create more resources? Thanos: Nobody? Alright then, mass murder it is." 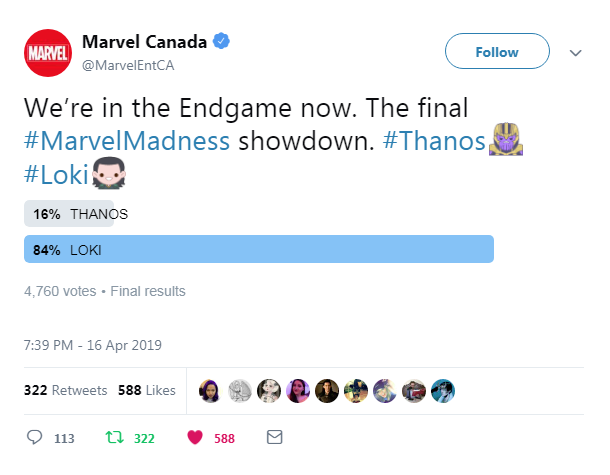 Marvel took a Twitter poll for ‘Favorite Villain’ with ‘Marvel Madness II’. This is a tough one because I have a hard time seeing Loki as a villain. Yet of all those, he would be my favorite too. Favorite person, though, not most villainous. And I have a hard time picking most villainous because I don't know who half those people are. 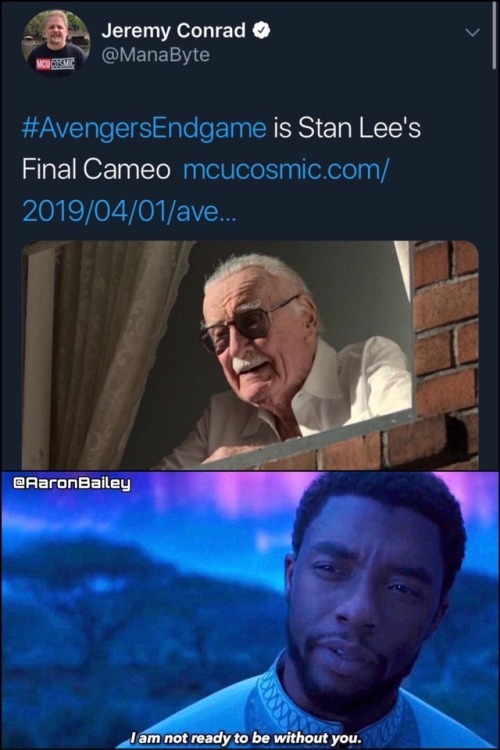 The very best thing about Captain Marvel was the Stan Lee tribute. 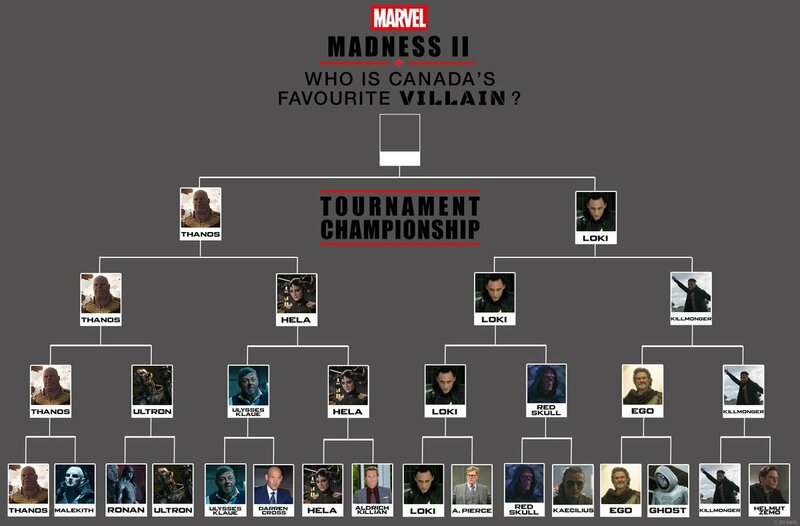 This is a tough one because I have a hard time seeing Loki as a villain.